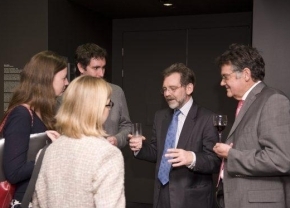 Professor Hugh White discusses Asian Security Issues with AIIA QLD members at an AIIA QLD event held in conjunction with Griffith University and the Queensland Gallery of Modern Art (photo courtesy of Natasha Vary, Griffith University). Membership fees include a subscription to The Australian Journal of International Affairs as well as entry to our fortnightly meetings where you will learn about the latest developments in international affairs. We rely on membership fees to keep our association running as we receive no core funding from the government. To join us, you may pay online via the Queensland Branch Membership Form.